As The Free Thought Project reported last week, blockchain startups have been offering interesting solutions for the cannabis industry, which is facing strict regulations from the government, as well as constant take-over attempts by large corporations. One major concern of cannabis advocates is the possibility of large biotech corporations like Monsanto patenting seeds or even DNA for different strains. A creative solution to this problem is a sort of cannabis genome project, in which researchers use technology that gathers the genetic information of the plant. Medical Genomics, the group behind the project, is publishing all of their results at Kannapedia.com using their StrainSEEK Identification and Registration service. Medicinal Genomics is a 15-person start-up best known for first sequencing the cannabis genome and open sourcing its genome as a scientific charity to the world. In addition to protecting strains of cannabis from corporate patent trolls, this registry will provide vital information to customers so they can finally know exactly what they are getting. Despite the fact that most dispensaries attempt to provide information about their products, that information isn’t always reliable and it isn’t easy for a customer to actually verify the quality of their purchase. Kevin McKernan, Cheif Scientific Officer of Medical Genomics, said in a recent proposal to Dash that he wants to integrate his research with blockchain technology. “Some jurisdictions are discussing mandating DNA fingerprinting of mother plants to enhance the seed to sale tracking system while IBM is publishing whitepapers encouraging the cannabis industry to adopt blockchains. We have also published our own whitepaper on the importance of genomic information in any Cannabis Blockchain and the enhanced utility delivered with DNA fingerprints. A barcoding system based on genetics offers maximal scientific utility to the grower and user community compared to the present RFID tag via arbitrary number barcoding systems,” McKernan said. Medical Genomics and its partner organizations are now a part of the Dash network and will be integrating all of the information on Kannapedia over to the Dash blockchain and it is all being funded by Dash. Another one of the biggest issues faced by the cannabis industry is the fact that it is still strictly a cash business since they are unable to collect credit card payments and are blocked off from traditional banking. The messy aspect ratio of this video is a recent artifact (only appeared since around Aug 2012) down to youtube dicking around. I could go on but it’s obvious what they’re doing. Just saying so you the viewer realize it not a lack of care on my part…. Since the 2016 election, President Donald Trump has waged war on gangs within the U.S., most notably the violent MS-13. For nearly 40 years, MS-13 has grown across the United States and Central America to become one of the deadliest gangs in the world. To understand the best method of combatting their continued rise, we must first understand who these people are and how they have grown to take over American cities. What began in the 1970s as a group of low-level drug users in Los Angeles emerged into a violent and satanic group in the early 1980s. Dara Lind of Vox Media explains, the LAPD’s first reference to the group was of the “Mara Salvatrucha Stoners,” but as civil war in El Salvador and conflict with Nicaragua intensified, it brought waves of illegal immigrants hardened from escaping violence in their home country. 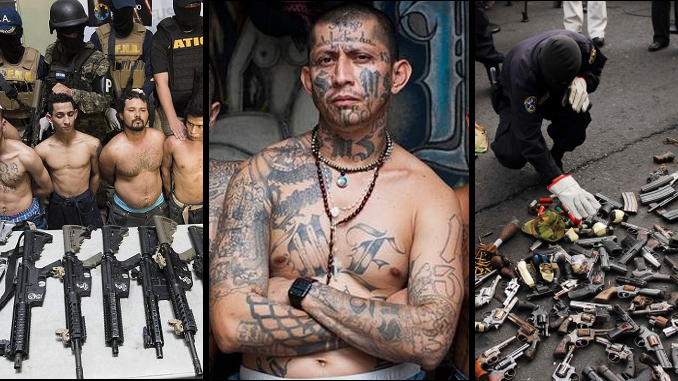 Immigrants from El Salvador flooded areas dominated by Mexican-American gangs and used brutal tactics, such as machete killings, to take control over the area and expand…. Seriously, what could americans possibly expect from the CIA’s foreign policies in latin america. This is how destabilization works, and its purpose is to concentrate political and economic power as the peasants seek safety from the state’s false-flag terror, such as the 9/11 staged event. The malign intent of our purportedly humane domestic policies is especially evident in the real government’s deliberate perpetuation of widespread and normalized child abuse in the USA, which has had the scientifically validated and predictable effect of raising the level of depression and of violence on the the street. Given Prescott’s discovery of the intimate connections between pleasure deprivation and violence shown above, it doesn’t take a lot of imagination to see the effect our uniquely american practice of imprinted medicalized genital torture and pleasure lobotomy is having on our crime statistics. Since HIV is just the caboose in the century long train of often comedically far fetched rationalizations for MGM, a covert agenda is again in evidence. What are the Watch Lists?? The watch lists are secret lists of people deemed to dangerous to fly, yet apparently not so dangerous as to require the issuance of a warrant for their arrest. The No-Fly and Selectee lists compromise the watch lists. The TSA has admitted that the watch lists function not only to promote the safety of air transportation, but also to disrupt the functionality of “terrorists” organizations by inhibiting their mobility. There is no due process mechanism for being placed on or taken off the watch lists. It is done entirely in secret, and in doing so ignores the protections afforded by the Bill of Rights against government tyranny. Whatever benefit they provide is greatly outweighed by the danger for abuse they present…. How much will Secure Flight cost? Who will have to pay for pay for Secure Flight? You will, either through higher taxes, higher security fees on tickets, or higher fares…. Louisiana Governor John Bel Edwards issued an executive order that requires the state to terminate all contracts with individuals or companies that currently boycott Israel or support those who do. Future state contracts will require parties to sign an agreement stating their compliance with the new law. This law may violate the Constitution of Louisiana that protects Freedom of Expression…. The liberty of a democracy is not safe if the people tolerate the growth of private power to the point where it becomes stronger than the democratic state itself. That in its essence is fascism – ownership of government by an individual, by a group or any controlling private power. Is the United States a true sovereign nation?